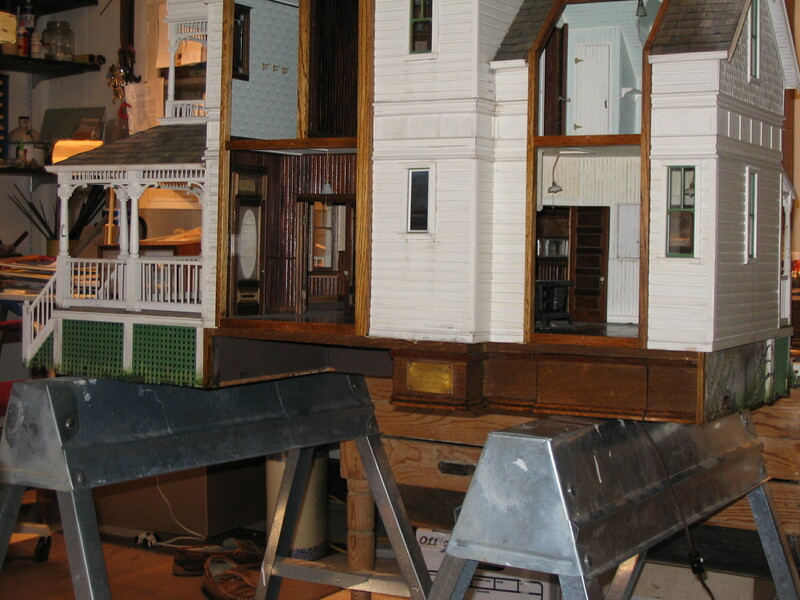 Moving a dollhouse is a dicey undertaking. These cumbersome and unbalanced objects have a way of expanding incrementally and secretly during construction. While we learned early on to design a house narrower than our 28” studio doorway, we didn’t always remember to account for the width of the trims. The first time we had trouble moving a house out of the studio was due to a 3/8” discrepancy between the widths of the door frame and the South Bend porch trim. Noel, master of the quick fix, simply got out his trusty jigsaw and notched the door frame, just enough so we could slide the trim through the gap. “But,” as he says, “I didn’t learn!” The next house fattened up to the point that another notch wouldn’t do–we had to tear out the entire door frame. Noel then reassembled it, notch and all, and just shoved it back in place, where it remained, with the help of a little masking tape, as a piece of floating architecture. The 28″ rule, like the 28″ waist, was no longer attainable. The South Bend has had more than its share of moves. 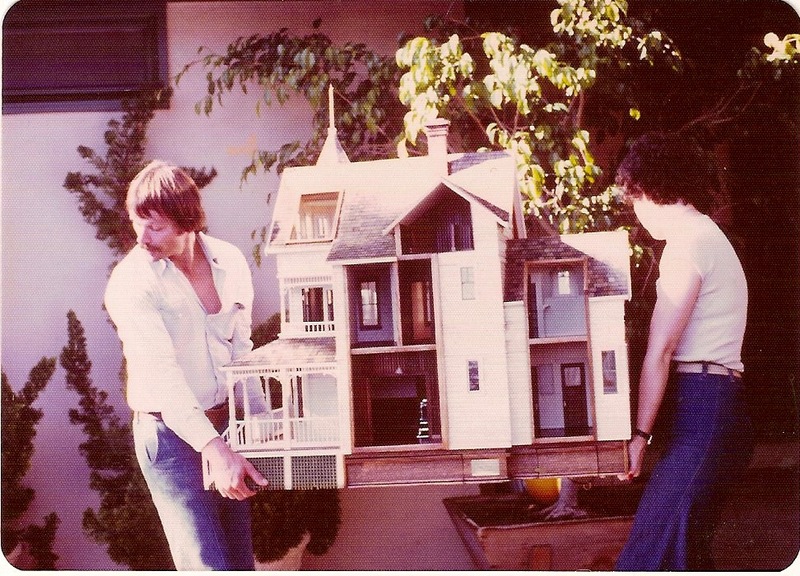 In 1977 we moved it from Seaview to its home of 28 years in So. California, down the coast and over the mountains in our van, and no, we did not have a barrier between us and the house, should worse have come to worse. To this day I believe the barrier of my worry was far stronger than anything material we could have installed. Once at the destination, the two of us would wrestle the house out of the van and up, down or around whatever path was required. In this case it was a fairly simple path, if a little long, and around a swimming pool. The best part was being able to enjoy the pool, a wonderful meal, and a lovely, warm California night in the customer’s guest quarters. 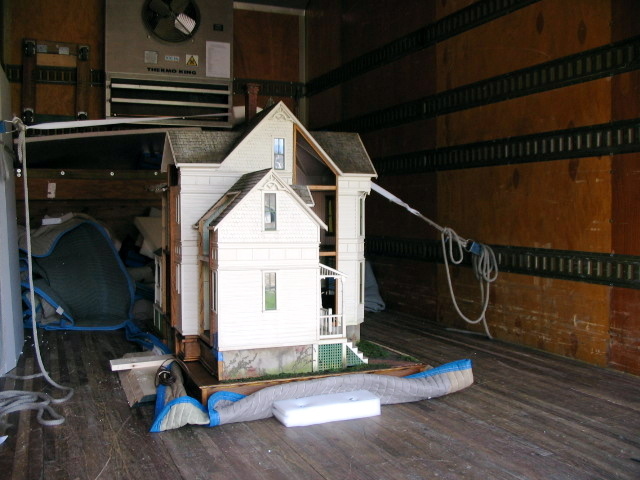 In 2005 The South Bend began its journey from California to its new home at the Museum Center in Maysville, KY, via our current studio in Astoria, OR, and Artech, the art shipper in Seattle. The house had been built before we discovered the fun of mysterious basements and the advantages to having the house on a raised base. Kaye Browning, the customer, asked if we could add these elements. (As a sideline, the previous owner had mentioned that as a child she had been afraid of basements, so we added a lock to the door leading to the then imaginary basement.) Given that we had always loved basements, we jumped at the opportunity to improve upon an earlier piece. It took some doing, but Noel figured out how to install a box room and stairs leading down from the now unlocked door, which would then be housed in a larger, overall base. Besides raising the house for better viewing, adding space for a yard and entry path, the expanded base, finished in oak, aids in the visual transition from miniature house to the full scale table it sits on. The hard part was fitting the puzzle pieces together, as, considering the weight of the house, we couldn’t just keep moving it on and off the base to check. This time there was absolutely no allowance for “incremental and secret” expansion. In the truck and on its way. This time we got it right, and the pieces slotted together without incident, along with sliding out through our Astoria studio’s 32″ door frame and into Artech’s truck for the trip north to Seattle where it would be packed for shipping and delivered to the museum in Maysville, where it is on display to the public today. 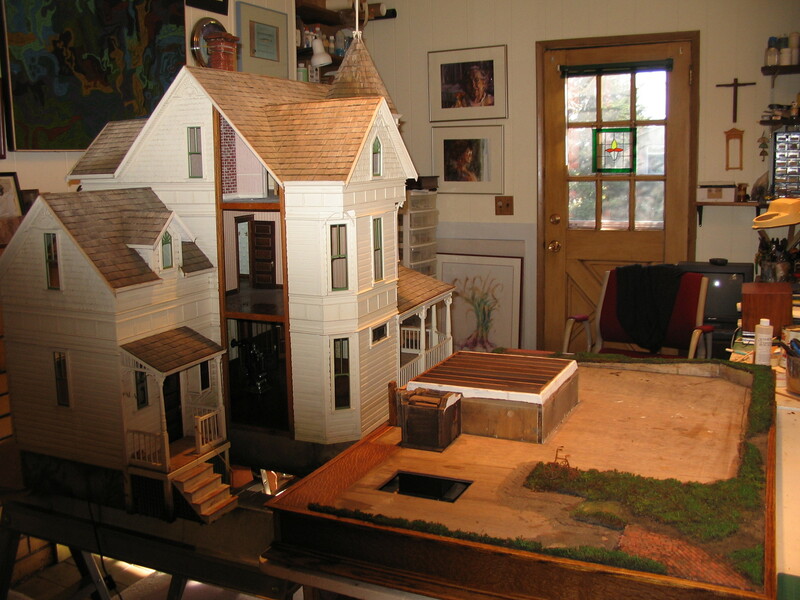 This entry was posted in Houses, Miniatures and tagged architecture, arts, basements, dollhouses, Maysville Museum Center, packing and shipping art, South Bend, work style. Bookmark the permalink. Pat and Noel, so glad to discover your blog. You two are amazing! I am so looking forward to going to Castine this Summer and will catch a glimpse of you two. Check out my website and let me know what you think. Patty and Leroy…what great friends they must have been. I’m sure you will miss them! Fun site, Nancy, looks like you’ve been busy!